Nexus Arts, Fri 29 Sep.
At tonight’s full house, Nexus Arts prove that it is not necessary to present similar acts on the same bill to have a successful gig. The two bands on offer could not be more different. The first act, Satan’s Cheerleaders, are here to launch their latest CD Satan’s Cheerleaders Perform The Music Of The Last Ninja and they want you to hear every track. They present as four serious male musicians dressed in black, their instrumental music is intricate but very listenable, and they are well received. They remind us from time to time of their name and that they have a CD for sale, but generally they let the music do the talking. They launch into a blistering set of power pop songs, their long hair perfect for head-banging, stopping only occasionally to reflect on happy memories, including of Australia. 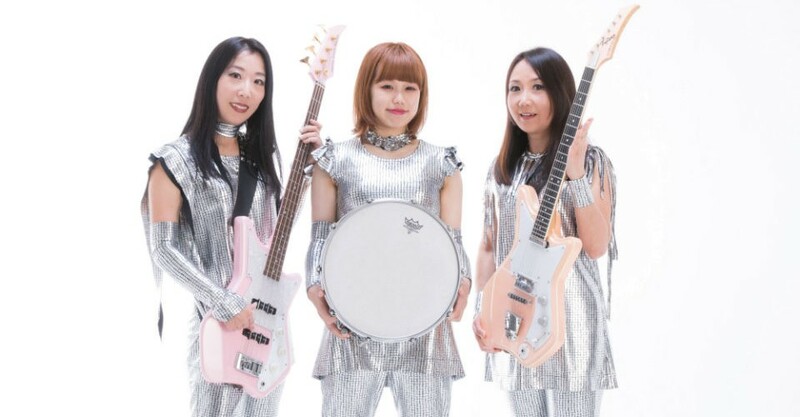 Vocals are shared between the three, singer-guitarist Naoko Yamano, bassist sister Atsuko Yamano, and drummer Risa Kawano. Their music is not at all intricate. Their more recent songs seem a little heavier, but it is perhaps closer to Status Quo or Susie Quatro than Black Sabbath. The lyrics are also very straightforward and infectious, seeming to reveal an obsession with food. Ramen Rock, Sushi Bar, Wasabi, BBQ Party (“Let’s have a barbecue – it’s a nice day!”). Their encore of Daydream Believer shows that if you’re looking for angst, you’re in the wrong place! The age demographic is an interesting mix of those who could easily have seen them when they last performed in Adelaide at Big Day Out 20 years ago, and those who couldn’t possibly have seen them. Both groups seemed to be enjoying them equally. Shonen Knife made many new friends tonight, and cemented their place as the happiest punks on the planet. Hopefully they will not wait another 20 years to return, but when they do they deserve a bigger audience than their cult status suggests. Arigato. Rocking at the Sushi Bar! !